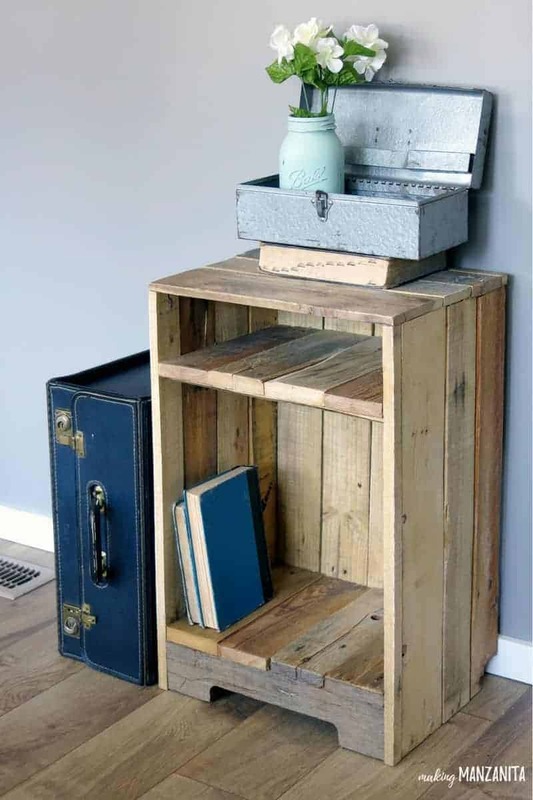 If you’re looking for inexpensive furniture, build your own with pallet wood. I love this side table with rustic style. We love pallets. Like…really love pallets. We have used pallets to build most of the furniture in our home (including our bed and this nifty AC cover)… True story, I had to talk my husband out of building a pallet couch. So, when we needed a side table in our living room next to the recliner…we turned to pallets, of course. I love how this pallet wood side table with rustic style turned out. We always have a steady stream of pallet wood in our scrap wood pile, so we literally spent NO money building this pallet wood side table. This fun DIY table was my crafty destash project of the month! I love this day every month seeing what all of the other bloggers have come up with using just the supplies they already have in their craft rooms (or garage in my case)! It always gives me so much inspiration to use up some of the supplies we all have sitting around! 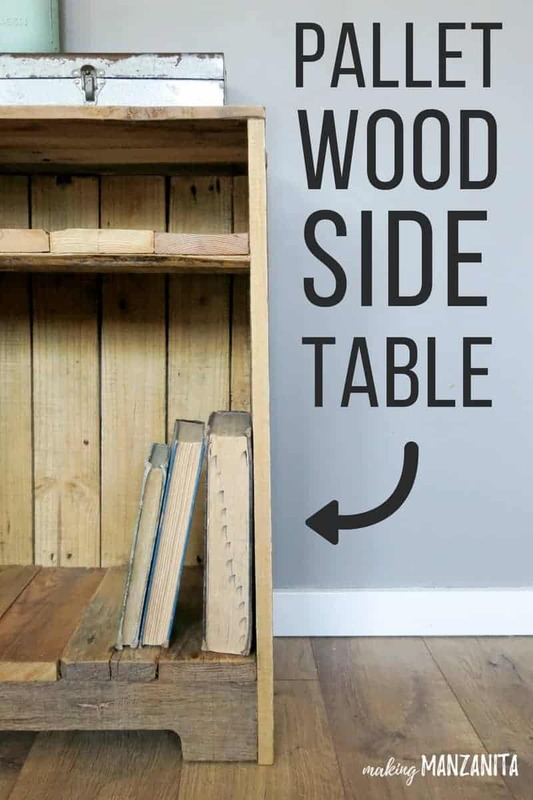 This pallet wood side table post contains affiliate links, but nothing that I wouldn’t wholeheartedly recommend anyway! Read my full disclosure here. Dismantle pallet. 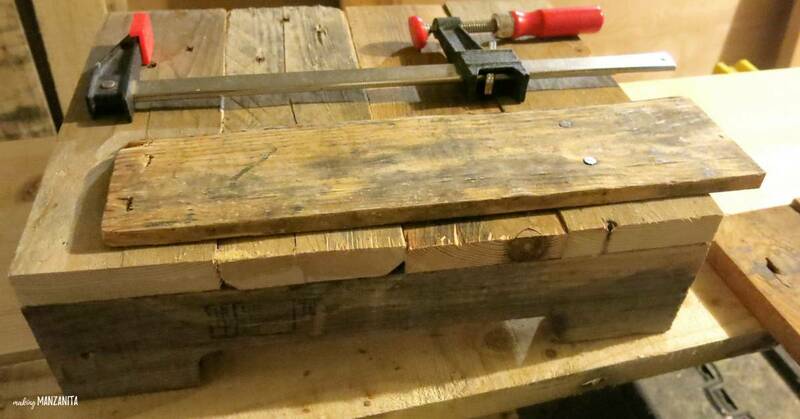 We typically use our handy Pallet Buster to take apart pallets in combination with a crow bar (shown above). We also lightly sanded the pallets after taking them apart. This helps remove any loose pieces or splinters. Build base. We created a platform base for the table by making a square and then covering the top with pallet wood planks. Attach side walls. We cut all of the pallet wood planks down to the same size and wrapped them around the base and nailed in at the bottom. 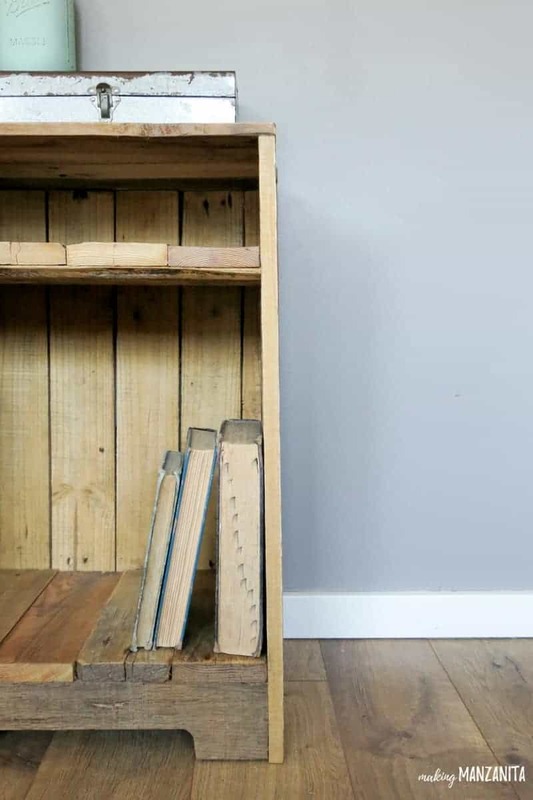 Build and attach shelf and top of the pallet wood side table. We added a shelf about 5-6 inches from the top. To do this, we drew a light pencil line around the table, cut the pallet wood down to size, held them in place and nailed from the outside. We added pallet wood planks to the top of the shelf and nailed them on around the edge from the top. Seal the pallet wood side table. We rubbed on a finishing wax. Isn’t that just the cutest little pallet wood side table you’ve ever seen? 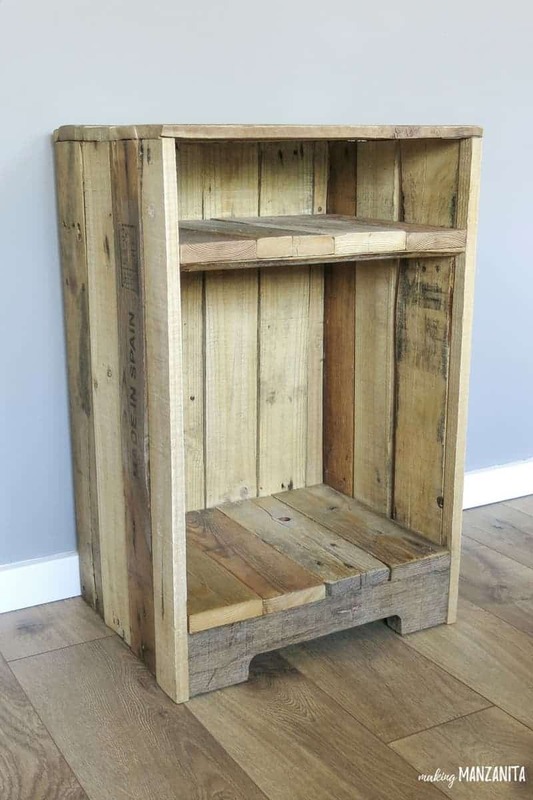 Building pallet furniture is a great way to create budget friendly, unique pieces for your home. My favorite part about building pallet furniture is that no one else in the world has this side table… ok well, maybe if you follow our pallet wood side table tutorial you’ll have a very similar table ! Hehe. But every pallet is so different so you’ll likely end up with something that looks a bit different. You can customize this pallet wood side table to fit in with your home. The wood can be painted, sanded and stained and just left natural like we have done. I had some fun staging this little pallet wood side table when I was taking some pictures for new inventory in my Etsy shop, Manzanita Exchange. P.S. That vintage metal tool box, vintage suitcase and books will all be available soon! Have you ever used pallets to build furniture ? Let me know in the comments !! Nice little side table! I have some wood hanging around that’s perfect for something like this. Currently I have glass side tables & dogs which means I they are always dirty looking! Thanks Kristie! Ya glass tables in our home would be dirty too with baby handprints and dog hair for sure! This is absolutely perfect for my front porch fall decor. I can imagine this covered with pumpkins and a little bit of plaid burlap I have left over. What a great idea! I never even thought of putting it outside! That is the cutest! Love that side table & pinned! “We” have done 1 pallet wood project, which is upcoming on my blog soon, so I’m not going to give away what it is yet, but we had a good time making ours. Hubby is the one who had the best time b/c he wants to make a coffee table next. Anyway, just love your side table! Especially love the printing on the side. Adds lots of character. Thanks friend! We love making pallet furniture. Can’t wait to see what you did! I am your new bestie now 😉 Thank you for this tutorial! 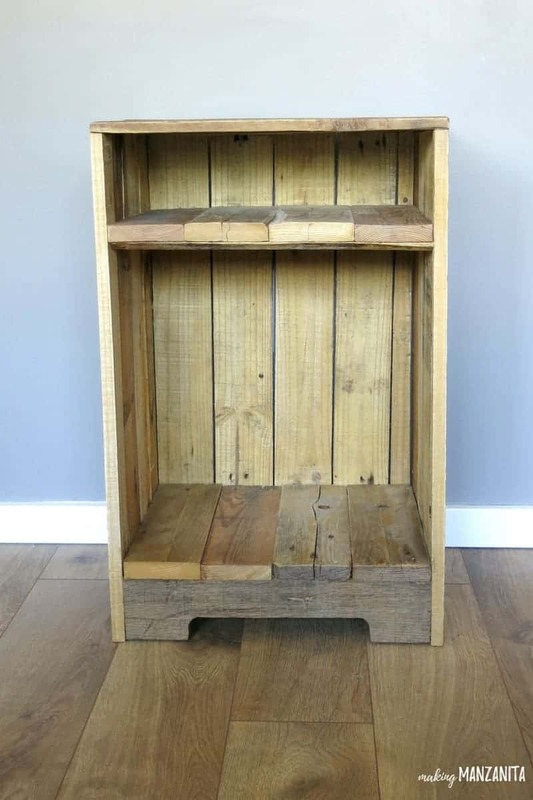 I am dreaming of making diy pallet furniture for years. I even scored one pallet so far. Problem is I live in an apartment and don’t have a garage. But I have a miter saw lol. 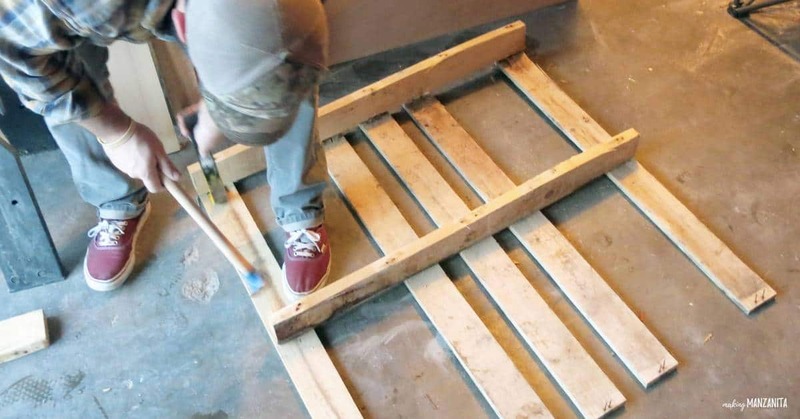 I love that I learned from this post that there is a tool to dismantle pallets, I’ll be pinning this project and go check out your other pallet projects right this moment. Hi Friend! I think I’m going to be posting something soon about how to take the pallets apart because it’s definitely a question I get alot! Stay tuned. Wow! I love this. I love palettes too but have never used them because Jeff and I dread taking them apart. I know…we are quite lazy. This just turned out so cute and you make it look so easy. I may have to get that old palette out that is sitting in the garage and make something. I may get hooked, right? I have only used a pallet to make a double sided sign for my side entrance but would love to tackle more projects in the future. Your side table is fabulous. Thanks for sharing. Thanks Donna. I love a good pallet project! You did an excellent job building the table. You will be able to use it anywhere around the house. I love using pallet wood for projects. Thanks Debra. Yes, I love how versatile the table is. Super cute and I love how you made use of the pallet skid to create a decorative element at the bottom of the table. Thanks Lydia. That’s my favorite part of the pallet to try to figure out how to incorporate! That is so cute – I haven’t used pallets but I’ve used old fence boards for a lot of projects (thanks for stopping by to comment on my cornice 🙂 Your other projects are amazing as well! 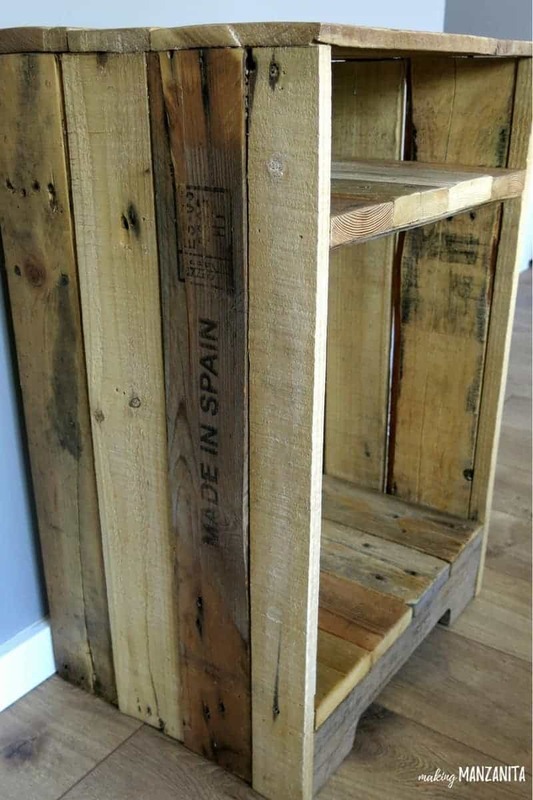 I have never made anything with pallets but I am sure itching to get to that! LOVE your table and the formatting of this post. Thanks also for making it easy to tweet. I did! I love how versatile the table is…could be used in just about every room in the house for something. I’ve wanted to mess around with pallet projects for so long, but I’ve never bit the bullet! Your side table looks awesome! You’ve gotta give it a try. 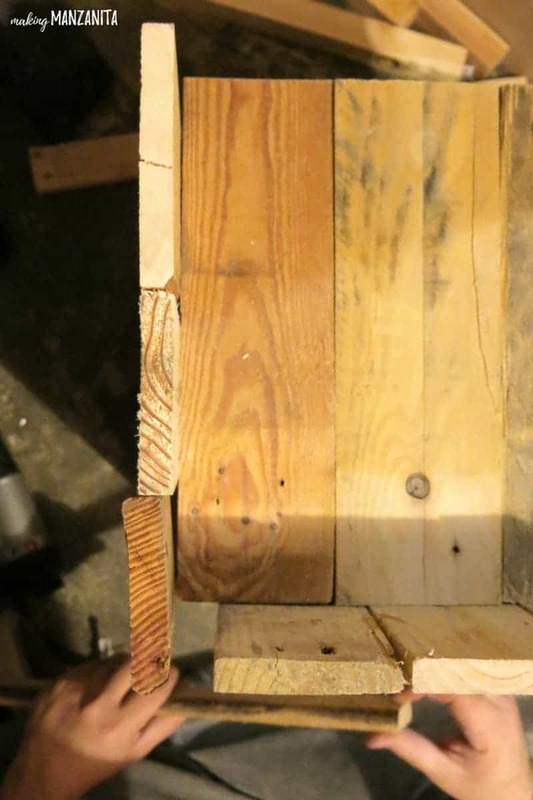 Did you know that Home Depot sells bundles of reclaimed pallet wood already taken apart too?! That is what scares a lot of people away from working with pallets. But I promise I’m going to be doing a post soon on how to take apart pallets if you’re wondering!